By hosting one of our cost-free, managed leaflet display stands in your outlet, you can help your visitors discover fantastic attractions and events in your area. Plus we'll take care of everything! 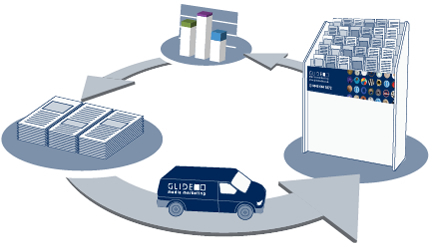 As a Glide outlet you have two options regarding how your titles are delivered and managed. You can choose to take one of our display stands which will be fully-managed by us with nothing further for you to worry about. Or, if you’d prefer to have more control, you can order online and select only the titles you require, whenever you want them. Both services are absolutely free! By opting to have our leaflet display stands sited in your outlet, you get the benefit of having us take care of delivery, distribution and ongoing restocking. And it won’t cost you a penny. All displays are branded to promote the local area or, for larger sites, we can use your own branding. All free of charge! 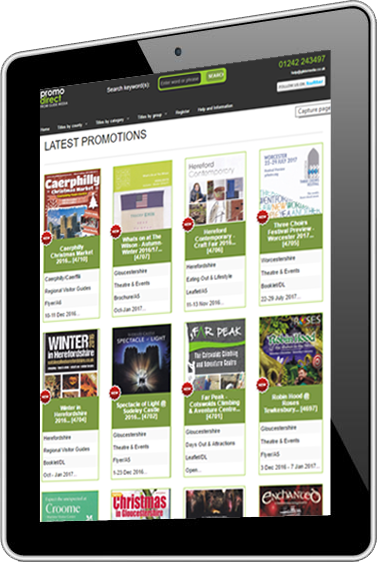 Take full-control of the leaflets and brochures you display with our Promo-Direct online ordering service. This allows you to order directly from the website, enabling you to hand-pick the titles your visitors want and re-stock as much as you require, whenever you wish. As an outlet can I choose which leaflets to display? We can place a display stand at your venue and service it ourselves. It’s your choice! Read more about ordering and stocking tourism leaflets or call us on 01242 576010 to discuss your needs. What size are your display stands? We have a variety of leaflet display stands available all on a “free loan” basis. Please call to discuss your requirements. We deliver every 1, 2 or 4 weeks depending on the footfall of the site. Is the service free of charge? Yes. There is absolutely no charge to you for either our display stand service or ordering leaflets online. And there never will be! There isn’t one! We are paid by our customers who produce the leaflets so can provide a free service to you and your visitors. &copy; 2019 Glide Media All Rights Reserved.